Philippe of France, Son of France, Duke of Orléans (21 September 1640 – 9 June 1701) was the youngest son of Louis XIII of France and his queen consort Anne of Austria. His older brother was the famous Louis XIV, le roi soleil. He was known as Monsieur at his brother's court. Philippe de France was born at the Château de Saint-Germain-en-Laye. Styled Duke of Anjou from birth, Philippe became Duke of Orléans upon the death of his uncle Gaston, Duke of Orléans. During the reign of his brother he was known simply as Monsieur. Openly homosexual, he married twice: firstly to Henrietta of England, Minette, sister of Charles II of England. 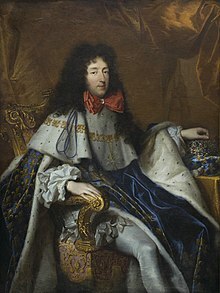 During their marriage, Philippe met and began a relationship with the Chevalier de Lorraine who was the great love of Philippe's life, their long relationship beginning in 1668. After the alleged poisoning of Minette, Philippe married again in 1671 to Elizabeth Charlotte of the Palatinate, Liselotte. He was the founder of the House of Orléans, a cadet branch of the ruling House of Bourbon, and thus the direct ancestor of Louis Philippe I, who ruled France from 1830 till 1848 in the July Monarchy. Through the children of both of his marriages Philippe became an ancestor of most modern-day Roman Catholic royals, giving him the nickname of "the grandfather of Europe". Philippe's other legacies include his decisive victory at the Battle of Cassel in 1677. Through careful personal administration, Philippe greatly augmented his fortune and thus the fortune of the House of Orléans. Élisabeth Charlotte d'Orléans (13 September 1676 – 24 December 1744) married Léopold of Lorraine, Duke of Lorraine and had children. 21 September 1640 – 14 May 1643 His Royal Highness The Duke of Anjou, Son of France. 14 May 1643 – 2 February 1660 His Royal Highness Monsieur, Duke of Anjou, Son of France. 2 February 1660 – 9 June 1701 His Royal Highness Monsieur, Duke of Orléans, Son of France. This page was last changed on 28 May 2018, at 16:52.